The CS 3252ci/2552ci Series seamlessly integrates with how you do business and can be part of an optimized Total Document Solution (TDS) approach to help streamline your workflow and maximize productivity. And with flexible configurations, you can combine the right paper handling, finishing and workflow solution capabilities to meet your business needs. Sales Service Supplies Lease. CS 3252ci/2552ci EXCEPTIONAL FUNCTIONALITY NOW COMES IN VIBRANT COLOR. MAKE WORK EASIER. Kyocera Copystar’s portfolio of customizable business applications take the CS 3252ci Series to the next level. From mobile and cloud to cost control and security solutions, these applications empower your workforce to leverage information how and when they need it. Using HyPAS, Copystar’s robust software development platform, these business applications seamlessly and securely integrate with Copystar MFPs. Pay only for the color you use with Copystar’s Tiered Color System. Simplify IT management with remote printing, file sharing and access to device status and set-up from anywhere on the network using Copystar’s Command Center RX. Mobile Accessibility. Puts print, scan, and send features at your workforce’s finger tips through applications such as Copystar’s Mobile Print, Apple AirPrint™, and Google Cloud Print™. Standard NFC (for Android) & Wi-Fi Direct support provide additional smart device convenience. 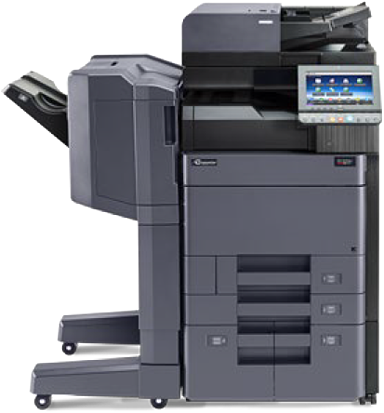 Get up to $1000 Back on your next copier purchase! 3 Tier Color Copies & Prints? As low as 2 cents per copy/print!